The Sinus Trilogy™ is a complete and all-natural nasal support system. The Sinus Trilogy™ products provide all the necessary ingredients to promote, maintain, and encourage sinus health all year long. There are three easy steps to naturally maintain sinus health. Think of them as offering 3 distinct phases: Relax, Soothe and Help Revitalize. Congestion Relief™ – Supports nasal health and aids in relaxing sinus membranes when allergens can make nasal health a challenge. Sinus Relief™ – Reaches deep into the passages to promote a healthy immune system when it is overwhelmed by pollution and allergens. 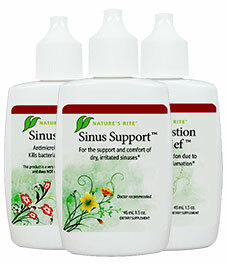 Sinus Support™ – supports the sinuses to moisturize and soothes all year round. Allergies, dry air, pollution, and molds can wreak havoc on your sinuses. The airborne contaminants can irritate sinuses to the point where they swell shut. Pollution and allergens make maintaining sinus health a challenge. A healthy sinus system communicates and interacts with your body’s immune system. It is extremely important to use promptly so that Sinus Relief™ can reach deep into the passages to encourage a healthy sinus system. Just carry in your pocket and use every 20-30 minutes. Works great in conjunction with Sinus Support™ and Congestion Relief™ to make the greatest trilogy of sinus care available on the market today. Support sinus health all year round with the Sinus Trilogy. Now there is something natural that you can do to soothe and support sinus health every day of the year. Sinus Support™ combines just the right herbs to soothe and support healthy sinuses with a normal saline and aloe vera spray. This combination supports the relaxation of sinuses, moisturizes them and allows the immune system to work even in the worst of environments. Sinus Support™ will keep your sinuses happy and healthy year around. This is very important for everyone who wants to maintain happy nasal passages! This spray is safe to use every day for moisturizing and soothing of dry irritated sinuses. Carry in your pocket to moisturize your sinuses all day long. A nasal spray for all seasons. Rinse away pollution, pollens, and allergens with a moisturizing and restorative spray. Sinus Support™ is so much more than a saline spray; you’ll never go back! Calendula: Supports in the soothing of sinus tissue. Yarrow Leaf: Supports the body in the reduction of swelling in nasal passages. Aloe Vera: Helps to soothe and moisturize. Grapefruit Seed Extract: Helps maintain a healthy fauna and flora. Your nose deserves better than just saline. Treat it well and it will treat you well. When your sinuses need a lot of support due to all the allergens in the air, reach for something natural! You don’t want some hash, addictive chemical solution. You want to help the body to relax the membranes and moisturize the dry, irritated nasal passageways. You want Congestion Relief™. This all-natural product uses Horseradish Root, Elder Flower, and Yarrow Leaf to support the relief of swollen nasal membranes. Then Eye Bright and Calendula help support and soothe the membranes. Finally, Aloe Vera supports the restoration of tissues while the Grapefruit Seed Extract helps maintain a healthy fauna and flora. All these herbs are provided by the saline solution to bathe and moisturize the sinuses. Because allergens are everywhere and you want natural, lasting relief. Allergens can lead to poor sleep and closed nasal passageways. Break that cycle naturally by supporting the process of soothing and relaxing swollen irritated sinuses. Using natural herbal constituents to support the nasal membranes to produce their own anti-inflammatory agents through phylogenomic activation. Support, soothe, and moisturizing of the membranes with calendula and Aloe Vera. Support the relaxation of the sinuses naturally so that you don’t become dependent. Horseradish Root, Elder Flower, and Yarrow Leaf: Support in the relief of swollen nasal membranes. Eye Bright and Calendula: Help in the structural support and soothing the membranes. Aloe Vera: Supports moisturizing and the restoration of tissues. Grapefruit Seed Extract: Helps to maintain healthy fauna and flora. Surgery is painful, expensive and often provides poor results. There is a natural solution. Discover the secrets to clear sinus health.